Emirates (Arabic: الإمارات al-Imārāt) is the largest airline in the Middle East, operating over 3,600 flights per week from its hub at Dubai International Airport, to more than 140 cities in 81 countries across six continents. 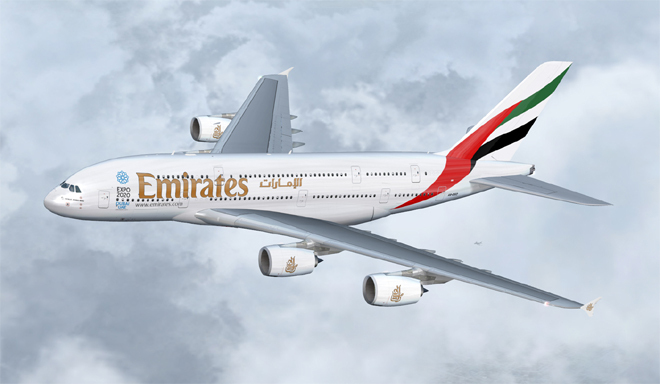 Emirates is the largest Airbus A380 operator with 83 planes in service and a further 59 in orders. Emirates also has ordered 150 Boeing 777X and 32 Boeing 777-300ER aircraft, and is the world's largest Boeing 777 operator. Emirates sponsors worldwide sporting events to promote it's brand, and provides its employees with benefits such as comprehensive health plans and paid maternity and sick leave.